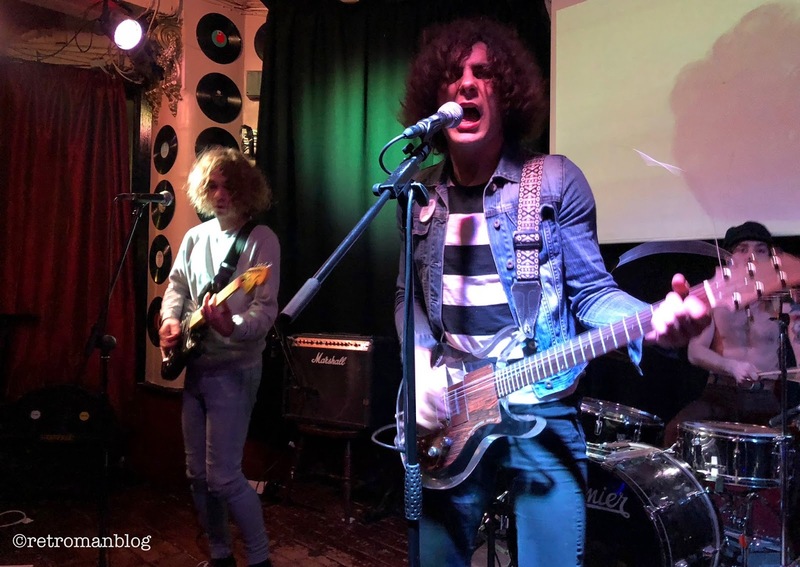 Start the year as you mean to go on, that's what I say, and Weirdsville’s New Year’s Eve Party has already set the bar high with another of their excellent nights featuring the best international Garage Rock, Psych and Punk bands. Tonight both acts were making their UK debuts and opening proceedings were Los Wallas from La Mancha in Spain - Don Quixote country - and with his wide brimmed hat and impressive moustache, the front-man of Los Wallas looks not unlike the familiar image of Cervantes’ hero. However, I’m not sure that Don Quixote wore shades and could play guitar so well..! They serve up an inventive concoction of Surf 'n' Psych with the occasional Spaghetti Western overtone and some complex guitar work weaving through the songs. The drummer is excellent, often hidden behind a blur of vivid pink hair she keeps everything ticking along nicely. Their set is full of opportunities for audience participation especially with the Bo Diddley shuffle of "Caiman". During the almost Samba style rhythm of "Salitre y Mezcal" the bassist and guitarist get down among the crowd to strut some choreographed moves with the front row. It’s a whole lot of fun and they end a thoroughly enjoyable set with a vicious version of Pixies’ "Isla de Encanta". Great band and they have a superb LP out now called "Sangre Sudor y La Grima" which is well worth investing in. Check out their Facebook page here for more info on the band. The headliners Les Lullies blistering assault was rudely interrupted by the arrival of the New Year and it seemed a shame to have to stop to celebrate. Once the hugs, kisses, balloons and party poppers had been dispensed with it was back down to business with the Rock 'n' Roll Kamikazes from Montpellier. Two of the band may be familiar, vocalist/lead guitarist Romeo and drummer Manu are also in Les Grys Grys, who are taking a bit of a break at the moment. When we saw Les Grys Grys at Hipsville a couple of years ago, my colleague the Rock photographer Paul Slattery was there and the band were excited to learn that he had taken some of the early photos of The Flamin' Groovies, big heroes of the guys. In fact tonight Romeo is using a Cyril Jordan style Plexiglas guitar, very cool. Whereas Les Grys Grys took a lot of their influences from raw British 60’s R’n’B, Les Lullies are taking a far more Punk Rock approach. Sure, they can still play a track called "Don Craine" in tribute to the Downliners Sect guitarist, but their sound is more of the mid-Seventies pre-Punk of MC5, The Saints and Radio Birdman. I guess there are a few current bands who are taking on this tuneful turbo-charged Punk such as Cute Lepers, Cyanide Pills and The Briefs but Les Lullies are surely leaving them behind in their wake. Romeo is a great frontman and a genius guitar player, watching his fingers flying around the fretboard makes your head spin. Either side of Romeo there's Bassist Thibault leaping about and Francois who kicks up a mighty racket on rhythm guitar. Powering it all along behind therm is Manu, a whirlwind behind the drums and anyone who has seen Les Grys Grys will know just how much energy he puts into a show. It's not just about the power and volume though as Les Lullies write some bloody great songs too, full of hooks and catchy choruses. In particular, "Don't Look Twice" deserves to be added to any Best of Punk Rock compilation from any era, it's that good. My highlights of their set included "Savage", which has a superb New York Dolls swagger and "Doctor" which wouldn't be put of place on Iggy & James Williamson's "Kill City" album. Well done Weirdsville, it's only January 01st and you've already introduced me to my new favourite band! Les Lullies have a superb new four track 7" EP on Slovenly Records entitled "Don't Look Twice" and you can check out more info at their Facebook page here. DJ's Fritz Buzzsaw and Adam Diddy Wah kept the New Year’s spirits high with their usual excellent selection of vinyl, which you can sample on their very own compilation albums “Buzzsaw Joints”. Both bands (and DJ’s) will be appearing at the Hipsville-A-Go-Go Weekender at Dreamland in Margate on the Bank Holiday Weekend 4th-6th May. Last year's Hipsville was awarded Retro Man Blog’s top Gig/Event of 2017 and looking at the confirmed line-up for the next one, I might as well pencil it in for top of 2018 now! For more info on the regular Weirdsville club nights at The Fiddler's Elbow in Camden check out their Facebook page here. There are more photos over at the Retro Man Blog Facebook page here and you can see more videos of the gig at our YouTube channel here. Here's one...enjoy!